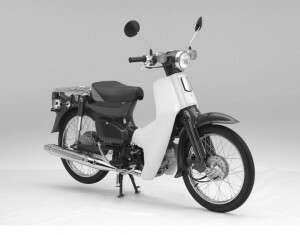 Honda finally found themselves perched right on the top of the biking world after desperate attempts to capture the 500cc crown during the latter stages of the 70s. The bike that gave them this authority was an unlikely race machine, surrounded as it was by totally complex, lunatic and rev happy, powerhouse machines. 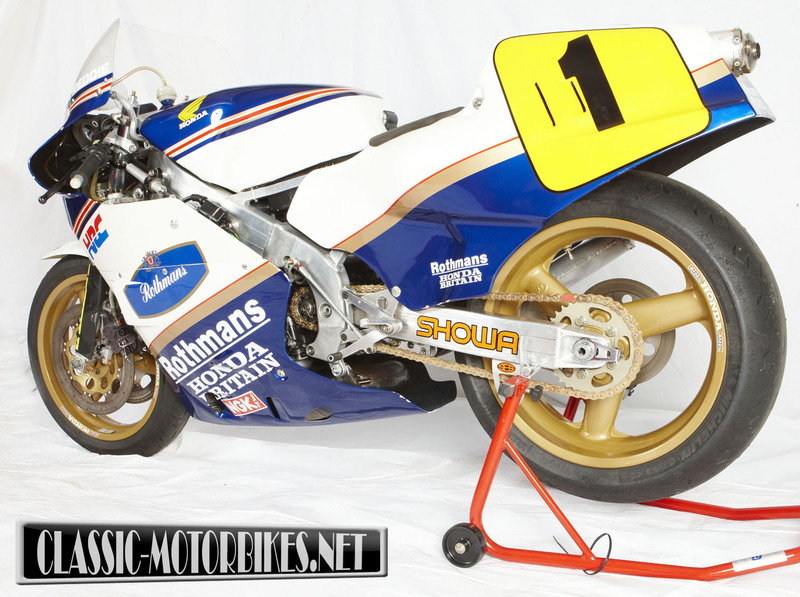 The small and lightweight NS500 was not hotly tipped as a winner before the 1982 season began but, as the old hair and the tortoise fable states, the winner of any race is not necessarily the fastest or indeed the most powerful. The unexpected switch to a two-stroke racer came after three embarrassing seasons with the oval piston NR500 four stroke, a machine rarely seen anywhere near the head of a race (it did win a non championship race once) despite having cost literally millions of Yen and having some of the best riders of the period to throw it around. More often than not the easier a bike is to get the very best out of the easier it is to circulate quickly, and with both Yamaha and Suzuki, along with Kawasaki, locked in a bitter battle for horse power and technical supremacy, it took Hondas different approach to essentially the same problem to come up with a real championship winner. 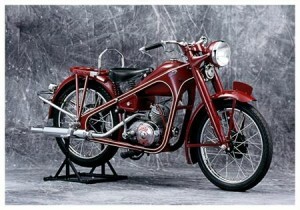 Honda design teams were sent to several GPs during the thinking process and they returned to Japan having assessed and carefully examining the others 500cc machines. The general thinking soon came up with the idea of a lightweight machine that had the frontal area and similar all up weight of a 350, a radical engine design to avoid similarity, and a compact chassis. 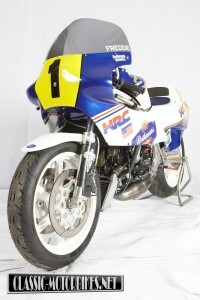 The diminutive Honda was not competitive from the outset and the potential of the reed valve three-cylinder engine was not thought to be enough to take on the might of the screaming fours but Honda did have many years of experience with two strokes, albeit in the world of Motocross and applied that thinking to this new project. 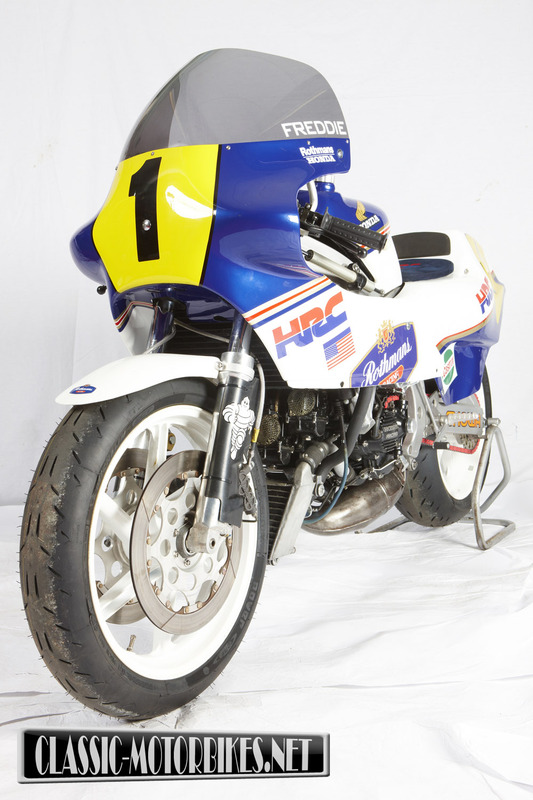 Of course to aid the progress of the new machine Honda employed the fastest rider on the planet, and the young Freddie Spencer was seconded to the project. Freddie gives us his unique insight on the period. Freddie “The top two stroke man at Honda, Miyakoshi, had designed a new power plant to replace the ailing four stroke NR project which I also rode during 1981. When I first saw the engine I thought it had a cylinder missing! Erv ( Kanemoto, Freddie’s friend, mentor, and engine guru) and I were presented with the initial 3 cylinder idea back in 81 and I was not keen at first, but I was very impressed with the Honda set up and agreed to stick with the team ready for the 82 season. When the bikes arrived ready for the first race in Argentina they weighed over 280 lbs, more than the Yamaha and Suzuki fours, and produced little more than 112 bhp, so I had to ride the wheels off it just to get a third place. Power came in at 9500rpm and disappeared sharply at 11,000 so we retuned the engine to go for maximum revs and a good deal of over rev to suit my cornering style, ignoring completely any low down power potential of the original reed valve design and when the aluminium frames and carbon fibre parts arrived we were not far off the pace of the other guys. Underneath “Fast Freddie”, the NS500 stole a few points here, a win there, and at the end of the year the seemingly impossible had happened and a top three finish in the championship was the result. Honda, with its underpowered, yet small and lithe machine, had been amongst the leading protagonists in the premier league, a class that had previously been the more likely stomping ground for the big, heavy weight machines. The following year the fresh-faced racer from Louisiana romped to six race wins and three second places to beat Kenny Roberts to the crown by a mere two points. 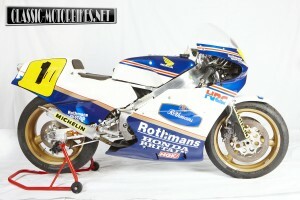 The Honda success story is not totally a joint Japanese/US one however, as much of the initial development work and nearly all of the race testing was completed by Ron Haslam, closely supported by an Aussie, Jerry Burgess, you know that man who was the force behind Doohan, and these days does a bit of spannering for a Mr V Rossi. The GP scene was to be changed for ever, as all the major Japanese manufacturers battled for supremacy, with Honda going on to surpass the great MV Agusta’s many title wins on their way to undoubted greatness and a certain place in the history books. 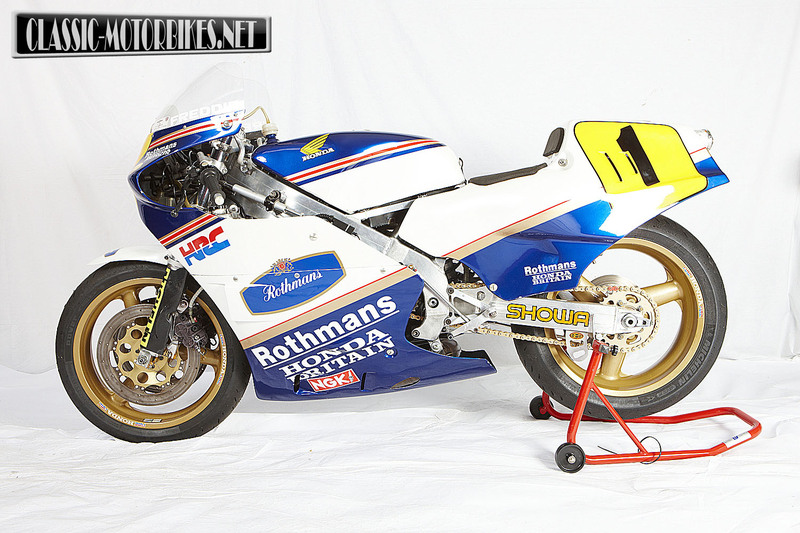 The NS500 had a short life at the top of the GP tree, as an official Honda factory bike at least, being replaced soon after the first title win by a much more fiery V-Four which in turn grew in to the legendary NSR500. Much of the thinking found in the triple was also transferred to the big four, with great emphasis placed upon internal friction and the single crank design, this idea lived on right to the very end of the NSR project in 2002. The triple did live on in a supporting role how ever, and the second division factory riders (every body except Spencer that is) continued for several seasons with the hardy and reliable machine. 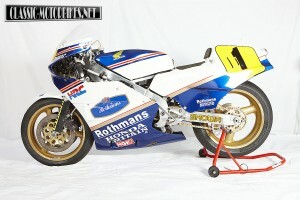 In private hands too, the cheap to run and relatively easy to ride RS500 became the bike upon which many a hopeful made his first foray into the premier league, the last privateer examples being seen around the GP paddocks in the early 90’s.